Every year at around this time, two things always happen: The obvious being the start of a new academic year; the second being time for us to grab a refreshed line of QNAP network attached storage system for review. For those who are currently working, good on you. For those who have not yet begun their post-secondary education, enjoy life while you still can. For those who are currently in university -- especially if you happen to be in engineering like yours truly -- prepare to be asterisk asterisk asterisk asterisked for yet another eight months, haha. Two years ago, we took the QNAP TS-409 in for testing, and used it on a daily basis for one year. While it offered brilliant reliability and impeccable uptime, its performance suffered greatly from a lack of horsepower under the hood. Last year, QNAP brought us the QNAP TS-439 Pro, which delivered the reliability and stability we have come to expect from the company after a full year of continuous usage. Thanks to its vastly improved hardware, it also took performance to a completely different level over its predecessor. The downside came down to being still a little too expensive for the specifications you get on paper (QNAP later released the TS-459 Pro a few months later with a dual core processor). This time around, the quality network appliance provider began shipping its latest line of refreshed network storage systems with the new Intel Atom D525 1.8GHz dual core processor. How well does the new hardware step up against QNAP's offerings from last year? We took the 5-bay version of the Pro+ series NAS, the TS-559 Pro+, for a spin, and will retain it as our main file server for the next year for our long term tests. We were among the first to receive the QNAP TS-559 Pro+ NAS box in North America. The good guys and girls at QNAP immediately expedited us a unit once it hit the shores in North America from its manufacturing location in Taiwan. Using UPS Standard, our review unit of the QNAP TS-559 Pro+ came in a large brown corrugated cardboard box from the company's American offices in Pomona, California, USA to us here at Calgary, Alberta, Canada. Everything arrived in pristine condition for our article this week. The same brown-suited UPS man came at least a dozen times in the past little while, probably wondering what the heck do I do. After cracking open the shipping box with much excitement, I was kind of surprised to find out how the TS-559 Pro+'s box looked. QNAP typically used tons of photographs, icons, and diagrams for graphic-heavy designs in the past, but the latest iteration of their product line proves to be very different. While it is still a high quality corrugated cardboard box enclosed by a series of flaps for future reusability, what we have here is an extremely simple package with no fancy images -- just a QNAP logo printed in black at the top. 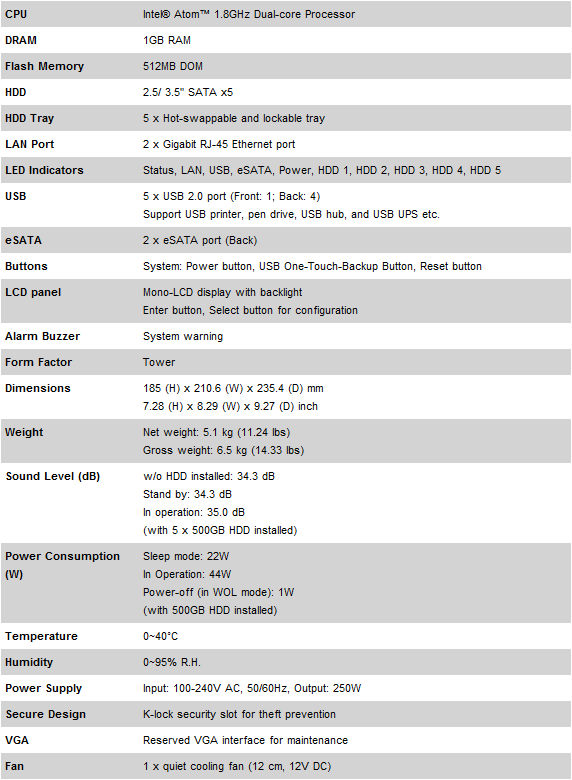 A mid-sized sticker hangs over the side signifying its TS-559 Pro+ model name along with a small image of the system, short highlight of its features, as well as the hardware specifications. You will also find its barcode and serial number, but that is about it. Since I doubt anyone purchasing a SOHO/business NAS would really over everything in detail on the box anyway (After all, intelligent users like yourself would be reading this review rather than doing research by looking at the box at your local retail store haha), less information is more information -- not to mention being able to save some cash on making these boxes! Opening the retail box reveals the QNAP TS-559 Pro+ clipped between two large Styrofoam brackets, and wrapped in a large plastic bag to ensure there are no bumps and scratches occurring during transport. Its accessories box is neatly placed on the side. Overall, it is very well packaged in both a practical sense and aesthetically speaking manner. posted 5 hours and 8 minutes ago, with 12 posts. posted 5 hours and 8 minutes ago, with 9 posts. posted 5 hours and 9 minutes ago, with 3 posts. posted 5 hours and 11 minutes ago, with 4 posts. posted 5 hours and 13 minutes ago, with 56 posts.